The new year inspires many of us to start thinking about our careers and explore new job opportunities. Before you begin your search, take some time to think about your professional brand and how you want to Brand You. Pledge to banish trite buzzwords and take these easy steps to reinvigorate your profile. 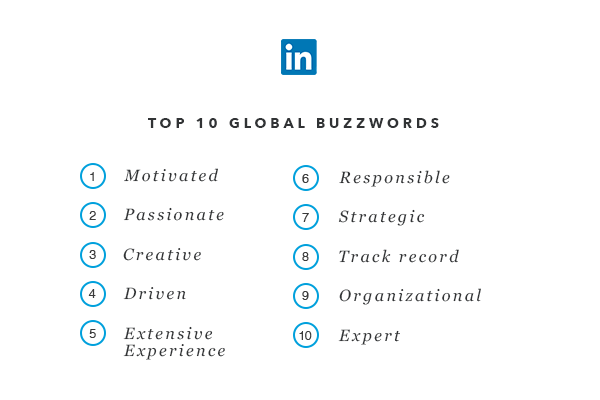 Your Summary: You’ve already promised to bump those meaningless buzzwords from your LinkedIn profile (right?). That’s a great start! But don’t go to your trusty thesaurus and replace one buzzword with another lackluster adjective. Rather, include examples that illustrate how you’re motivated. How did your motivation ultimately drive business results? Has your motivation helped champion a program? You can easily illustrate your motivation by uploading examples of your work in your LinkedIn summary that showcase the results you achieved. Your profile photo: Take a good look at your profile photo. Does it reflect the professional image you want to portray? Your profile photo counts more than you may know – you’re 14 times more likely to have your profile viewed if you include a photo, so make sure it shows your best professional self. Think a work-appropriate outfit, focus on head and shoulders, and a confident smile. Your headline: Don’t bury the news! Write a strong headline that makes people want to learn more about you. For example, “Mary Smith: Solving complex technical problems through code" says so much more than “Mary Smith: Software Engineer.” And if you’re actively seeking a job, say it in your headline. Your good side: What better way to show you are a motivated person than by including your volunteer experience and the important causes you support? It can also help you get hired. Forty one percent of professionals surveyed by LinkedIn in the U.S. alone stated that when they evaluate candidates, they consider volunteer work equally as valuable as paid work experience. Your skills: Listing your skills on your profile makes you 13 times more likely to be viewed on LinkedIn. Your skills are a visual overview of your professional brand – an easy, digestible way to show what you can do. You’ll want to include a mix of high level and niche skills to ensure you show up in search results and showcase your range of talent. Your champions: Let others vouch for you by asking for recommendations. To get the best recommendation possible, ask someone who has worked with you to provide specific examples of your skills and talents. Feel free to gently remind them of the projects you worked on together as a jumping-off point. With these simple updates to your profile, you can set yourself apart and help brand YOU as the best candidate for your next opportunity. Get started today.